La Villina is the ideal place for families or groups of friends who want to spend a holiday on Lake Iseo. It consists of two brand new and completely independent apartments that can be rented together or separately. The house is really cozy, has large windows overlooking the lake that allow you to keep the rooms cool even during the hottest periods. Our guests will feel pampered and at ease enjoying all the comforts that the Villa offers. It is a very special and unique place if you want to spend a holiday feeling at home in this area of the high lake. 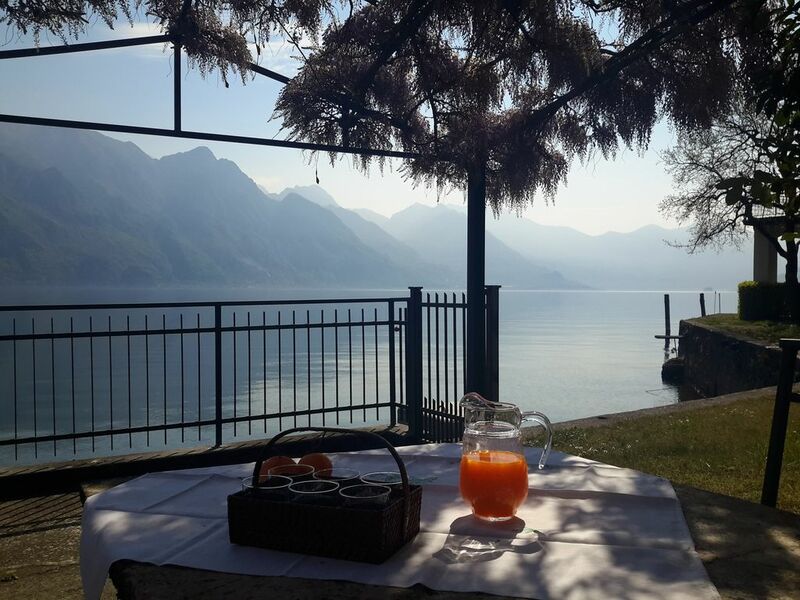 The house is located in an excellent location, convenient and close to visit both art cities such as Bergamo, Brescia, Verona and Milan, both to discover beautiful villages typical of the lake such as Riva di Solto, Lovere, Pisogne, Iseo and Monte Isola , the largest island of European lakes. Tolle Wohnung direkt am See. Schöne Woche, danke. The holiday home, in a quiet and panoramic position, is located in Riva di Solto (Bergamo), a small and characteristic fishing village, on the shores of Lake Iseo. Riva di Solto is located at equal distance from the cities of Bergamo and Brescia, two important centers rich in history and culture. The geographical position of Riva di Solto allows you to enjoy many attractions so you can organize a holiday tailored for you, your family or your friends in any season of the year. For nature lovers, possibility of excursions on foot, horseback or mountain-bike in the hills or in the Orobic Pre-Alps, but also to visit sites of great naturalistic interest (Valle del Freddo, Torbiere del Sebino, Pyramids of Zone) or to take trips on the Lake Iseo and the splendid Montisola, the largest island of European lakes. For culture lovers we recommend the Tadini Academy of Lovere, the Rock Engravings of Valle Camonica, Pisogne with the Romanino frescoes, Trescore with the Lotto frescos, Bergamo and Brescia with their important artistic, historical and architectural heritage. Not to forget, for wine lovers and good food, the food and wine tours that will lead you to discover famous and quoted products of Franciacorta and ValCalepio.